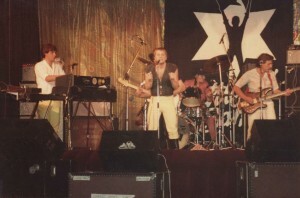 These are some pictures taken at the Grafton Ballroom in Liverpool, not sure of the year but this was the bands first attempt at the National Battle of the Bands competition. I don’t think the band got through this year, and I don’t remember who did win this heat., French Lessons were back in the competition the following year when the North West round was help at the Mounford Hall Liverpool University Student Union. This time French Lessons won through to the Northern Final held at the University of Birmingham. 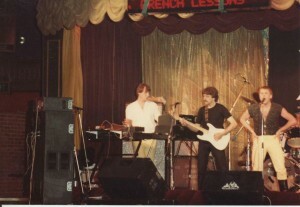 French Lessons didn’t win this one either and again I don’t remember who did but they had a drummer called Spider who mimed on his Simmons kit.